Jose Abreu belted his league leading 10th home run… and he’s a rookie. He only sits in Group D because of the unknown playing time in February with Adam Dunn and Paul Konerko also available to man firstbase. But he’s definitely proving that he belongs in Group A, so if you have him this year, you won’t get such a great discount in 2015. The Brewers still remain #1 in the ESPN Power Rankings but that may change this week after Braun clocked Segura in the FACE before injuring himself on a bunt single. A lot of big names got injured: Bryce Harper, Mark Trumbo, Ryan Braun, Hanley Ramirez, and Chris Davis. 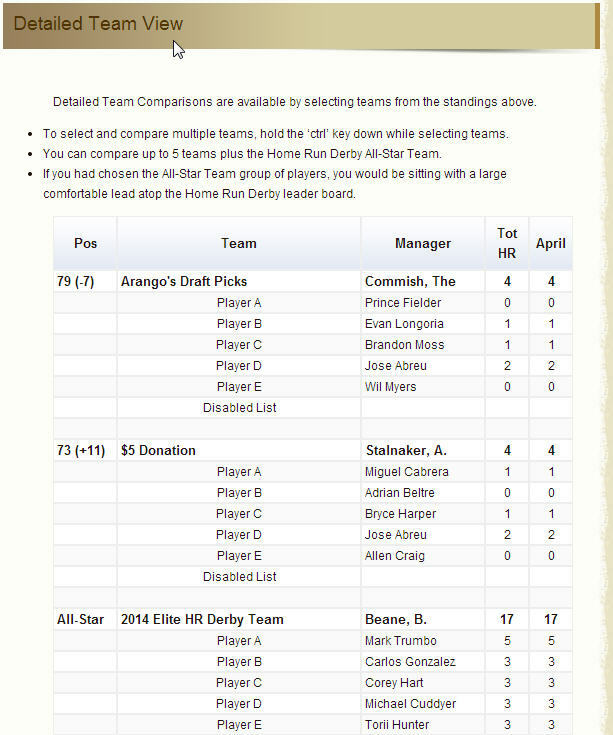 Most of these guys are out for a while too, so keep tabs on their trade eligible dates for the Kings of Cork HR Derby. Brandon Marrow walked 8 batters, gave up 2 runs, and was pulled from his no-hitter (in the middle of the 3rd inning) on this past Saturday. Oh ya, and on Wednesday Michael Pineda got ejected for pine tar on his neck. He was accused of it in his first start a week earlier. So he either doesn’t understand what ‘subtle amount’ is or Pineda sweats pine tar… which would be the worst superhero power ever. The first and third bullet points matter most to the Home Run Derby crew. One being positive for some of the owners, and the other being awful news for most of the owners. So let’s see how the best and the worst fared in this weeks breakdown of the Kings of Cork Standings. They say the top is lonely, so we will have to ask the owner of team Lil R on how lonely it is at the top because their team pretty much went wire-to-wire in the month of April. There are a few days left with about 4 teams to rival Lil R, but you are probably looking at the first winner of 2014 in the Kings of Cork HomeRun Derby. Even if it’s lonely, I bet it feels pretty good. Our biggest movers of week 4 belong to teams Meow and Crash Davis. Both of them moved up over 40 spots in the standings by belting 12 and 10 homers, respectively. And both of them can thank Jose Abreu (mentioned above) for half or almost half of the teams weekly home runs. Yes, Abreu hit 5 last week. 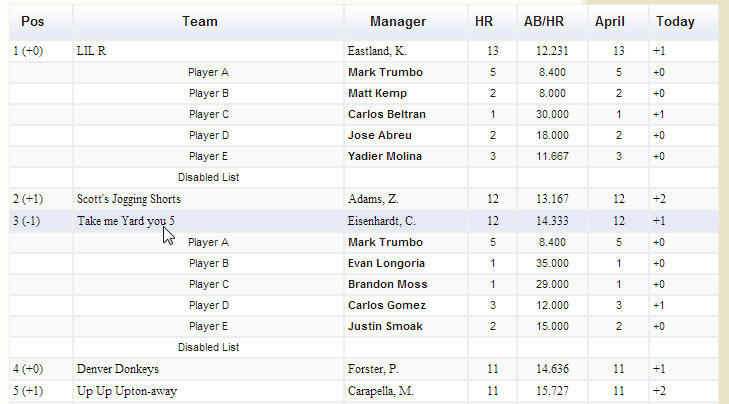 Meow got even more help from Khris Davis (yes, with a ‘K’) and McCutchen with each of them contributing 3 in week 4. Not to be outdone, Crash Davis got 3 of their own from swing-and-miss Chris Carter. Again, there are some teams that are just ‘too good’ to be able to climb 40 spots in the standings but still require a shout out. The Big Stinkey (moved up 32) also hit 12 homers this past week, Mad about Abreu hit 11 homers and moved up 29, and long time player Kettle Poppers hit 11 homers resulting in a jump of 19 spots. What did they all have in common? Yep, Abreu again. And after another big start to week 5, they are all inside the top-15. In with the good, out with the bad. Thankfully, no one laid a goose egg this week. But we did have 5 teams manage only a single tick on their home run totals: Lutherdad, The Little Stinkey, Golden Trouts, A little bit of baseball by my side, and Dawg Pound. Most of these teams didn’t have any significant injuries in week 4 to minimize their AB potential. But most of them now do with Harper looking at surgery in the up coming weeks. The biggest movers in the wrong direction were Dawg Pound losing 33 spots and A little bit of baseball losing 31 spots. Don’t worry guys, April is almost over so you can’t lose too many more spots in the month and then everyone starts fresh for the month of May competition. Good luck to the contenders in the month of April. And remember, the 2012 derby was won by the team that finished last in the month of April that season. So no team can be counted out yet.